In an effort to channel more advertising revenue, Facebook will start selling TV-style ads on the social network for between $1 million and $2.5 million per day. The price will range by the size of the audience reached. Facebook opted to keep the commercials at 15 seconds to maintain the familiar format of Facebook’s Instagram videos. The ad spots will be available later this year. Bloomberg.com reported on how the social media network is taking on the television networks and becoming the dominant place for advertisers to be. 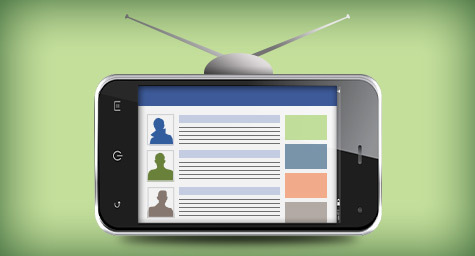 These TV-type ads will allow Facebook to capitalize on the millions of users who visit the site daily, especially during the primetime TV hours that mean so much to advertisers. With Nielsen research citing that Facebook attracts more 18- to 24-year-olds during those coveted primetime hours than any of the four main TV networks, Facebook will be firmly positioned as a viable virtual alternative to TV. “Every night, 88 million to 100 million people are actively using Facebook during prime-time TV hours in the United States alone,” said Facebook COO Sheryl Sandberg. Facebook already lets advertisers broadcast their videos to a user’s news feed, but the new commercials will allow these advertisers to buy 15-second spots directly in those news feeds. Another difference will be seen in how Facebook will sell the commercials. The new spots will be offered on a full-day basis and targeted by age and gender. This differs from their current ad approach of allowing marketers to additionally target ads by interest and location, which are options not available with TV networks. This decision to follow the targeting approaches of television ads is meant to make the process familiar to companies used to buying TV. Facebook users need not worry about being bombarded with ads because they won’t see a commercial more than three times in an entire day. Since Facebook CEO Mark Zuckerberg is extremely sensitive to how users accept advertising on the site, he’ll limit the number of ads to only about five percent of a user’s news feed, which is approximately one for every 20 updates. Facebook is merely the latest of many online platforms that have been vying for the ad dollars that have typically been spent on television. Google sparked the trend with its original content channels on YouTube, which led AOL to launch HuffPost Live. Twitter has also been chasing TV advertisers by recently expanding its service that markets direct promotions to users who tweet about TV shows while they watch them. Twitter also has also partnered with TV networks like ESPN, CNN, MTV, and Fox to stream videos on its site and share the subsequent ad revenue. While many digital companies have struggled to lure advertisers away from TV due to the lack of metrics that compare TV audiences to online audiences, Facebook has a distinct advantage because they already have a strong relationship with Nielsen, which is the top TV rating metrics firm. The companies have been collaborating to create a ratings measurement system for online content that counts Internet viewership similarly to television. This partnership will allow advertisers to compare its value to TV via equivalent Nielsen ratings figures. With its new TV-style spots, Facebook will become more attractive than ever to advertisers and prove why it’s the place to be and be seen. Discover the difference of advertising on social media. Contact MDG Advertising today at 561-338-7797 or visit mdgadvertising.com.